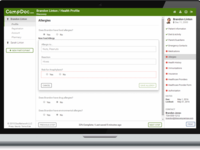 CampDoc.com is the leading electronic health record system for camps, offering free online registration, travel and emergency medical protection, discounted camp medical supplies, and one-way parent emails. 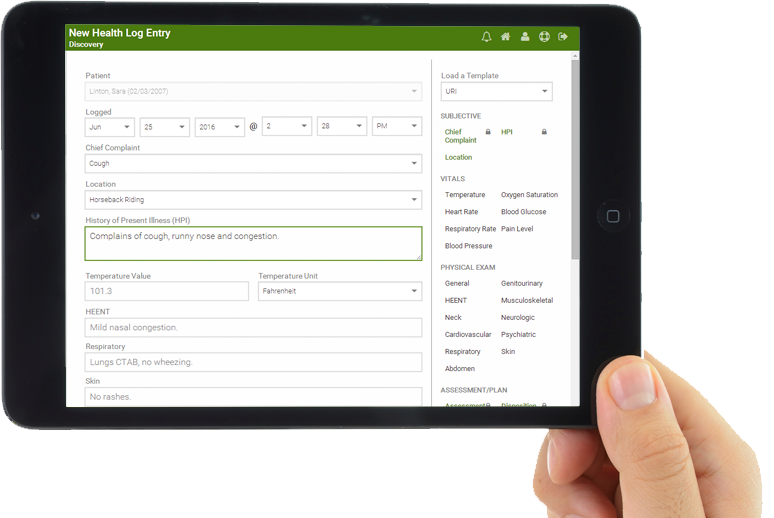 Designed by camp doctors, nurses and directors, our secure, easy-to-use web-based solution manages health forms, allergies, medications and illness/injury tracking, to keep health and safety in the forefront of camp operations. 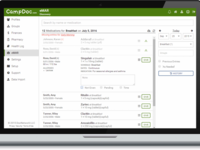 Pros: CampDoc has really helped our company with camp and a conference. It was great to have all of the medical history and insurance cards before the event. Overall: At our camp, we didn't have WiFi, but we were able to print all food/environmental/drug allergies and prescriptions that were needed to be taken at camp at certain times of the day and included the dosage. Our nurse would administer the prescriptions, and then sign-off on the paper copies. Pros: The health log allowed us to log a camper's name and reason for visit (automatically saved with a time stamp) helped us treat more kids in a more efficient manner. We would often return when the office was less active and complete the entries, and share them if necessary. I liked the ability to customize the entries for the drop down responses. Overall: Putting the responsibility on the parents to complete their children's profiles improved our complete health record rate. Previously, using paper health records, we had no way to track incomplete profiles, however we began Week 1 with 20% incomplete, but with each week and with mass communication tools you provided, the incomplete profile rate dropped and we averaged between 6 and 10% total. We estimate that this number is far less than any year using paper health records. Many parents were grateful for the ease of the online format, filling the information out from home or on their phones. Uploading through taking a picture with a smartphone was the most helpful tool in getting important forms from parents. Nolan, our account manager, was very responsive and always clarified the questions I had, or he worked quickly to find an answer or solution. He is one of the reasons our first year with CampDoc was as successful as it was. Pros: Ease of use, eMAR is very well thought out (I know we aren't using it to it's fullest capacity, but we find it great for our needs, filters to narrow down specific populations are excellent and came in handy daily. Cons: Customer support was very much a disappointment this year compared to last. Parents were told to call the help line, advertised with very broad hours, yet the line was often not picked up by a person or parents were told to call our camp by the help line. This caused distrust among the parents about entering in their children's medical information in this system. The representatives also seemed less willing to help our staff this year when called with problems, less educated on problem solving, and at times, short on the phone or by email with our staff. I'm not sure what the change was from last year's wonderful experience, but it definitely affected our experience this year. We will most likely use this program again, and we are hoping for a better overall experience. Overall: Consistency with the year before (previous campers), medical information at our fingertips, ability to sort in a variety of ways and pull lists from the sorts. Pros: Our account manager is great! She's always knowledgeable, helpful, and professional, and she's also fun and personable. It usually felt like I was reaching out to a friend for help. Cons: We always have a handful of parents who express concern with putting so much personal information online. We also have a handful of parents who struggle with uploads; my guess is they're using old browsers. It's not hard to help those few families with their profiles. Overall: I have only heard positives from our staff. Obviously, there was a learning curve and we had internet issues at our site, but after that things went smoothly. I had a question one day and reached out to your support staff. They responded quickly and with an easy to understand answer! Pros: I just wanted to leave a note to express some appreciation for everything you all do for us. One of the reps is our main contact but I've spoken with a number of people at CampDoc and every single person I've worked with has been helpful, knowledgeable, and positive. I really feel like the staff at CampDoc are part of the team of people who make my job as Director easier, and it feels like we're all working together to give campers a great summer. Additionally, I don't ever feel like I'm being upsold or pitched to, even from the staff who work in sales and services. Cons: No cons to report at all, I am very happy with CampDoc! Overall: I really stand by my support for you and all the work you do. It's truly been great working with you. Thanks! Pros: One of the customer reps. was exceptional! He always worked at my pace and never made feel like I was asking dumb questions. I felt that the live training was very informative but it was especially important to me that I could go back to a pre-recorded version to refresh on a topic or relearn something at my pace. I loved the screenshots as I could print them and walk through the materials with staff using them as a guide. The support team was always helpful to me and in many cases our parents too!! Cons: We currently do not have the ability to use a computer to store information so had to print everything for our various camp sites. We knew this going into the process, but hope to have some tablets next year to help. It still is such a time saver for staff and parents to be able complete all the paperwork online! Pros: It was a pleasure using CampDoc this summer. It's pretty self explanatory, organized and made camper information accessible whether at camp or off site. I received a one-on-one review with the camp director and everything else seemed self explanatory. I worked at another camp last year, who used a different software, and found CampDoc to be more accessible/easier to navigate. Pros: Registrations are so much easier since they are organized by camp. Saves time to have parent reminders sent about balance or completing health information. Printing reports makes camper information easily organized to be prepared before camp starts. We liked the improved methods of sending bulk emails to parents. Overall: Every time I have needed to call and talk to someone they are so friendly and helpful! Kirsten is always really helpful and patient with me. I appreciate that she checks in to see how things are going. She is very quick to respond to my questions and always willing to work with me! Pros: Rep was amazing and always very helpful. They were readily available and helped us make decisions based on the system and our policies. Can't praise them enough! 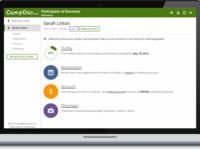 Cons: We've loved using CampDoc and it's really improved and streamlined our records system! Thanks so much to rep and all the other amazing folks who are incredibly responsive and helpful. Pros: Nolan, our account manager, was great! This was our first year using the software and we never once felt like we were alone in this. Nolan was there every step of the way, answering every question and fixing every problem! I would email him with what I thought was a catastrophic problem and he would just simply correct it or explain in to me- crisis averted within minutes!! He is an absolute lifesaver! He made this summer so much easier. We will continue to use CampDoc.com in the future almost entirely because of his assistance and dedication to making our program successful this summer. Such a pleasure to work with him- he is an essential part of OUR team, as I'm sure he is in your team as well. Overall: Camp documents were available to all administration, regardless of where they were on the campgrounds, at all times (rather than having one single paper copy of each document only locate in the main office). The communication with families greatly improved. We felt much more connected to parents and they have commented the same. Time spent checking and rechecking, shuffling through papers each time we wanted to find one small fact/detail for each camper was becoming very frustrating and tedious. Having all this data complied in one place at the click of a mouse has helped us to learn new things about our camp and how it runs. We will be making changes next year as a result of this data. Customer support was excellent, and all members of your support team that we had contacted were very helpful! Pros: We had 7 different health care providers for our 9 weeks of camp this summer and transitions were critical to keeping us running well. 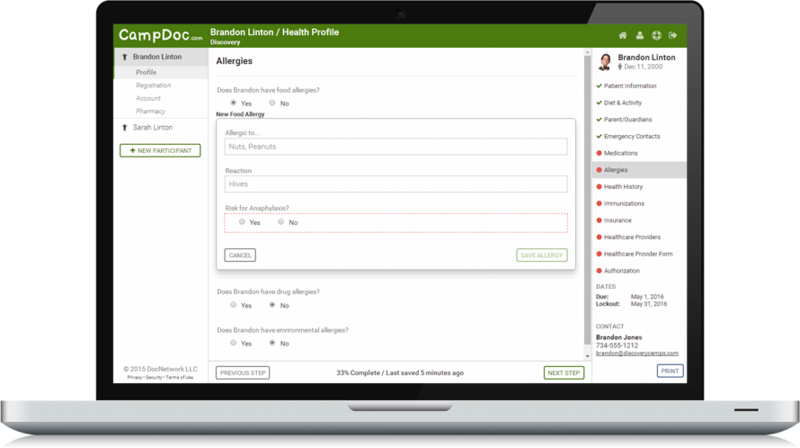 With CampDoc they could review patient info in advance of their arrival, communicate questions, and hit the ground running when they arrived. Overall: Every one of our healthcare provider found the system very easy to learn and manage. CampDoc has a variety of helpful service options and I liked that I could choose the ones that work for our business. Pros: It has also been great to be able to use this as a registration platform for other regional events, as campers already registered can basically sign up with a few clicks, and we already have all the other relevant information. Give it a try! Overall: I don't have any negatives to report at this time. This service has worked well for us for the past two years. It has a lot of extra features from a health management side that we have not fully utilized, but could be very helpful for your camp. Cons: Some of the on the fly health reports for scraped knees and things like this could have a simplified version of this report. The report for this area is quite extensive, and sometimes more than that is needed for what was done. Overall: This product has changed the way that we do our check in procedure for the better. We were 40% faster with our ability to check people in. In years Past at one of our camps we would normally get a visit from the Sheriff Department due to the traffic that drop off first day of camp creates. Since we started using CampDoc we no longer have this issue. I cannot speak highly enough of the ease of use, and how many hours it has saved the parents as well as us. Pros: All the information is inputted directly by the parents and is accessible to our medical staff to reference whenever needed. The reports are wonderful and helpful. Overall: We have been using CampDoc for 5 years and it has been an amazing experience. Whenever we have questions or any issues, the team is always available to help and walk us through. The scheduled trainings have also been extremely helpful. CampDoc makes accessing important information simple, fast and easy! They ROCK!! Pros: Where do I start. We have campers all around California and out of state. Our old system was complicated, not user friendly and parents would have to mail or email us additional forms. With CampDoc everything we need from parents are all in one place. If parents forget to sign or fill out, we can just email them to go in and take care of the issue. On the back end - user friendly for staff. Everything they had to do on paper now can be done online from assigning cabins, reviewing special request, rosters, etc. Cons: At the beginning it was a challenge with the integration with our current software. the Communication between three parties was challenging but at the end it was worth it. Pros: The ability to customize the software to our needs helps us to get the most usage out of this service. Cons: Sometimes it can run very slowly, but overall, I have very few complaints. Overall: We have been using Campdoc.com for 3 summers, and our experience has only improved. The staff works with us to get the most out of their service that we can. This has improved the paperwork and efficiency of the camp health office tremendously. Pros: SSA LOVES the team member ! THANK YOU FOR ALL YOUR HELP!!! Cons: You guys are growing a lot, but SSA loves that it always feels like we're working with a small company that keeps everything in check and organized! Overall: I value the messaging feature above everything else. It makes communicating with families so easy, and I really love how I can see if parents have opened the email and what time they opened the email. Pros: The customer rep was great to work with, and I really enjoy working with your team and appreciate the ability to customize our tools to work for our needs as much as we can! Cons: We did have some hiccups early on because of the complexity of our custom system, but once I explained our needs further, Customer rep was quick to assist and get issues resolved. Thanks, rep! Pros: My camp is based in California, so the extended customer support hours you offer help me contact support easier. In the past, there would sometimes be a delay in getting my questions answered. This year I could call and have my questions answered right away! Overall: I've used the software for 3 or 4 years, and enjoy using it each summer. Thanks for always making improvements. We look forward to using CampDoc.com again! Comments: Every time I had a question it was answered quickly and everyone was very helpful. The response time was amazing. Kirsten was great in getting back to me quickly, and even answered one of my questions the same day when I sent an email at 7pm. Everything that we had questions on she handled quickly and cheerfully. Our parents were very happy with CampDoc.com too. The training webinar were also great. CampDoc.com made our check-in process go a lot more quickly. Very happy we chose CampDoc! Pros: We loved the online registration part of CampDoc. My account manager was beyond helpful! She answered my questions quickly and made changes to our account sooner than anticipated. Always professional and helpful. Do not know what I would have done without her. Our account manager was absolutely wonderful throughout the whole process. Pros: CampDoc was very easy when it came to looking up allergies, or activities kids could or could not participate in. Also the eMAR was extremely easy to use and made charting very easy! The knowledge base was very helpful for myself and our nurse too. I can't think of any improvements at this time. Overall: Corey was the best! We plan on using Corey and CampDoc again next year since he made everything so seamless! Anytime I had a question, I would email him and have a response within minutes. He went above and beyond for us and we are truly thankful! 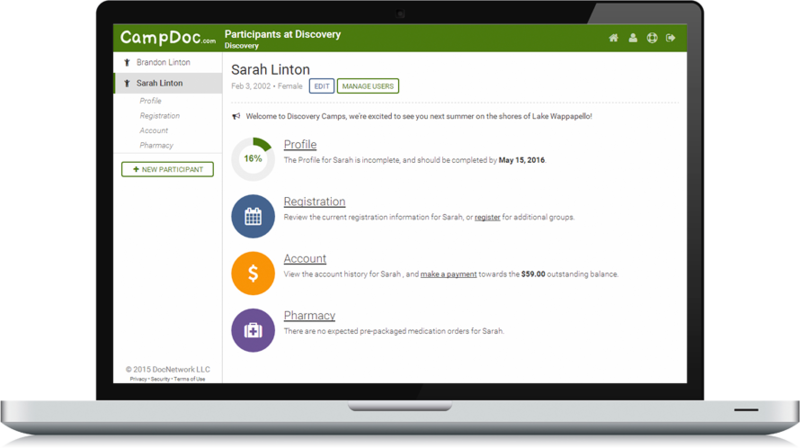 Pros: This was our first year using CampDoc.com and we had researched several electronic health record programs. It was a good way to gather health data and track what was turned in. Most of our nurses and physicians were able to use it. I am looking forward to using this system in the future. Cons: I am hoping health information will be carried over into the next year such as immunizations, health history etc, as we have returning members. Overall we have a positive experience! Pros: From the user friendliness to the great customer service, CampDoc has been great for the summer camp that I coordinate. Most of all, CampDoc is so affordable given the power of their system and all of its capabilities! Overall: Many of the functions are easy to use, and very helpful. I love that they are always willing to customize to what our needs are. It's been a great summer! Pros: This is our 3rd summer using CampDoc and I am finding new and great features that CampDoc has to offer. I have been in constant contact with Amy and she's responded to every questions and need. Cons: Nothing to report. I have utilized your support team to help parents with their questions as well, and found it helpful. Pros: I just wanted to take a moment to let you know what a pleasure it's been to work with Kris on our CampDoc transition. He's been extremely helpful, quick to respond to our requests, cheerful, and patient. Last year Kris helped us launch CampDoc for our health profiles, and this year we are using CampDoc for registrations and staff forms also. We launched last week and we are so happy with how functional the database is. Keep up the good work! Very satisfied with the program and what it offered! Pros: Our health forms were more organized and able to be accessed remotely for all of the sites used. Staff were able to input additional information as needed. Authorized pick up section helped improve the safety and efficiency of check out times. Also, the support team was extremely helpful and responded to questions in a timely manner. Overall: CampDoc.com was a great program we used to efficiently track campers health information, and see what information was still needed for our YMCA camp! Pros: Our customer service rep was so patient with me! I had very specific Qs, and he always helped me to the point where I hung up with NO more questions. He is the best! He deserves a raise after dealing with me. Ha! Pros: Thanks especially for always getting back to us in a timely fashion when we reached out for help. Rep does an excellent job! Our account manager had big shoes to fill following another rep. He was very supportive, knowledgeable, and prompt with his support, 10/10! We look forward to using it again next year! Pros: Thank you for being a great support to our camp operations. Our staff really did enjoy CampDoc.com and home much it made our jobs easier. Thank you for the continued support! The support staff was very positive and extremely informative. He went above and beyond to help us understand the process! It's been a pleasure working with CampDoc and I look forward to using your services in the future! Pros: Customer support representative is a true joy to work with and was always prompt and helpful with any question I had. The level of support was very high and made the transition very easy for TIP. She and all of the other professional staff we interacted with increase the value of your product. 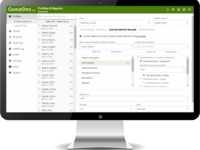 I work in the area of receiving and approving profiles, and CampDoc was incredibly useful. 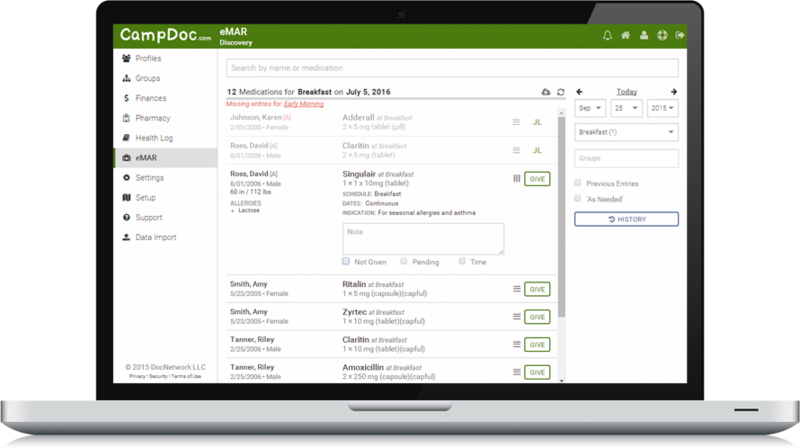 Our program administrators used eMar and the Health Log and this was our first year of having this information collected online so it was incredibly useful. Overall: The system is easy to use and best of all portable. My health supervisor can be signed in on her phone getting information no matter where she is in camp! Amazing first experience this summer! Pros: CampDoc.com was actually quite helpful from an administrative standpoint. We liked the extended support and weekend hours this summer too, it proved to be very helpful! 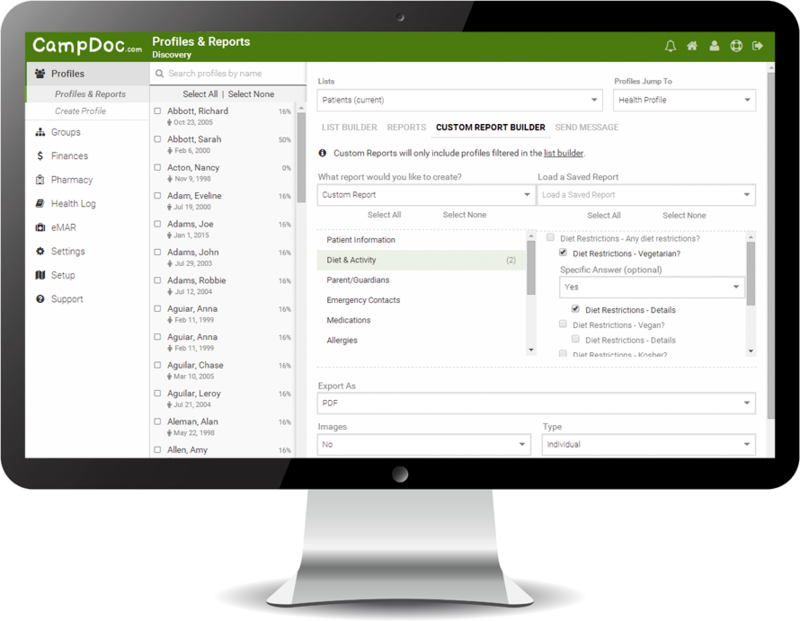 Pros: once you know how to use it there are so many valuable reports that you can make and it save a lot of time. Cons: That it saves all the sessions from previous years so making list for the current year can be difficult at times. Overall: Camp Doc is great, at first it can be a little over whelming because there is a lot to learn and it can be used in so many different aspects of camp. 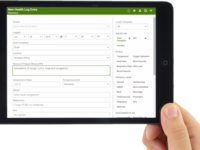 Once you take the time to learn how to use it, it save your camp administration so much time. It is great to have a one stop shop for camp! Pros: CampDoc.com has allowed us to make our registration process more efficient and go paperless, with registration and payments. Knowing that the medical records are secure and we don't have to store them on-site is a a big help too.! Pros: Our account manager is awesome! Super timely, very helpful, had answers and patience for all of our questions! We love the improvements you make every year. Thanks for all that you do and we look forward to next summer! To my friends at CampDoc! Pros: Well, once again I was thrilled with CampDoc this summer. I appreciated the familiar and the new improvements, as well as the customer service and quick response from you. Overall: I utilized the "help" folks, who were efficient & knowledgeable. Pros: Just wanted to drop you a line to let you know how well CampDoc is doing for our purposes. I've had only a few questions from parents - one who had mistakenly enrolled their child in the wrong camp (we issued a refund flawlessly), a few who wanted to apply the coupon code after hearing about it (our members), and several who, honestly, just wanted to speak to a person to make sure there was one available. We've had no issues with registration, no issues with payment, none with refunds or changes to accounts. CampDoc is a great program and so easy to use! Pros: We return year after year to using CampDoc.com because the support team and account representatives are so fantastic and we are able to run successful camp programs with CampDoc.com by our side! CampDoc.com was user-friendly for the staff and a great tool for camp! Comments: CampDoc.com was user-friendly for the staff and a great tool (especially at our larger programs) where the health room was utilized daily by many students who needed to take their meds. Nolan, our account manager, has been super helpful all season with us! Your team is very responsive! Pros: Our nurses loved the eMAR and felt it was much easier than paper. Just click each time you administer and then you're done. Overall: Nolan, our account manager is incredibly responsive, easy to work with, ad takes care of things in a simple and concise manner with a respect for everyone's time. Pre-season CampDoc is a complete time saver. We don't have to review any forms, matching paper documents, nothing. Pros: Our account manager, CSR, is a great person to work with and he has never left us hanging. He always answers my questions and helps in any way he can. He also takes time to contact us directly to see how things are going, and we like that. Cons: Nothing to report at this time, we feel comfortable with the system. CampDoc has been the best thing that has ever happened to us in 30 years of existence!!!! Pros: TRUELY. You'd keel over if you could hear how we used to do things. Don't get me wrong, our old software did serve us for a few years, but it's just not progressive enough to meet our organizational needs. Thanks! Cons: Thanks again for all your help the other day. No negative feedback, we have been tremendously happy! By far my favorite and the best service company I work with! Pros: I'd like to let you know how much I appreciate your hard work and dedication to our small program. You are always so kind, prompt and courteous! Pros: We held our weekend bereavement camp in the first weekend of June so our use of CampDoc is completed for this year, but we continue to be incredibly happy with the program and will certainly be using it again next year! Overall: Thank you to the CampDoc.com team for your wonderful service; warmest wishes to you for the summer! Everyone I worked with was very knowledgeable, helpful, and friendly! Pros: Medication management and contacting families was greatly simplified and efficient. Overall: Our families loved the online registration. Many mentioned how much easier it was for them. CampDoc.com streamlined the process, gave our nursing assistant experience with documentation of medications and injuries. We really liked the program and plan on using it again next year! Comments: Always an excellent experience. Kirsten, our account manager, is always helpful and professional. Our camp nurses found the health log to be very helpful too! I'm such a fan of CampDoc! Comments: I'm such a fan of CampDoc that I keep coming up with new ways to implement the program around here. We LOVE collecting travel plan information through CampDoc. We've never had such reliable and easily accessible information about camper arrival plans. Because we now know exactly how many campers to expect at each bus stop, we've been able to send fewer buses downstate each week. This saves us in fuel each week, in addition to the wear and tear on the buses and the staff time needed to make the two-day trip down and back. It's fabulous!